The companion DVDs contains the powerful Pearson IT Certification Practice Test engine, complete with hundreds of well-reviewed, exam-realistic questions. The assessment engine offers you a wealth of customization options and reporting features, laying out a complete assessment of your knowledge to help you focus your study where it is needed most. The DVDs also each contain more than 60 minutes of personal video mentoring from the author. 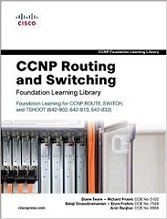 CCNP Routing and Switching Foundation Learning Library is a comprehensive foundation learning package for the three CCNP Routing and Switching exams: ROUTE, SWITCH, and TSHOOT. The three books contained in this package, Implementing Cisco IP Routing (ROUTE) Foundation Learning Guide, Implementing Cisco IP Switched Networks (SWITCH) Foundation Learning Guide, and Troubleshooting and Maintaining Cisco IP Networks (TSHOOT) Foundation Learning Guide build your knowledge of CCNP Routing and Switching topics. These authorized CCNP Foundation Learning guides are written by experts, bringing years of teaching and consulting experience together in an ideal self-study format. These foundation learning guides help you understand the topics on the three CCNP Routing and Switching exams. 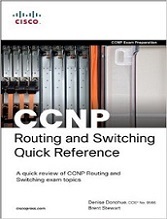 CCNP Routing and Switching Official Certification Library is a comprehensive review and practice package for the three CCNP Routing and Switching exams: ROUTE, SWITCH, and TSHOOT. 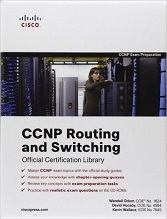 The three books contained in this package, CCNP ROUTE 642-902 Official Certification Guide, CCNP SWITCH 642-813 Official Certification Guide, and CCNP TSHOOT 642-832 Official Certification Guide, present complete reviews and ample opportunity to test your knowledge of CCNP Routing and Switching exam topics. These authorized CCNP Routing and Switching study guides are written by CCIE® certified experts, bringing years of teaching and consulting experience together in an ideal test preparation format. 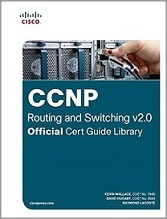 CCNP ROUTE 642-902 Official Certification Guide teaches you how to use advanced IP addressing and routing to implement enterprise-level router networks connected to LANs and WANs. CCNP SWITCH 642-813 Official Certification Guide ensures that you have the skills necessary to implement scalable, multilayer switched networks. CCNP TSHOOT 642-832 Official Certification Guide helps you master the troubleshooting methodologies, tools, and tasks needed to effectively monitor and maintain large enterprise networks. As a final preparation tool providing a review of CCNP exam topics, the CCNP Quick Reference 2/e complements official Cisco curriculum, other books, or other exam preparatory material in a candidates preparation for the four CCNP exams. This concise guide provides you with detailed, graphical-based information, highlighting only the key topics on the latest CCNP exams in a review-style format. This fact-filled Quick Reference allows you to get all-important information at a glance, helping you to focus your study on areas of weakness and to enhance memory retention of important concepts. 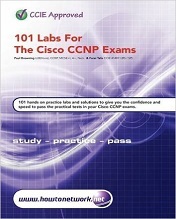 This book provides a comprehensive final review for candidates taking any of the CCNP exams. 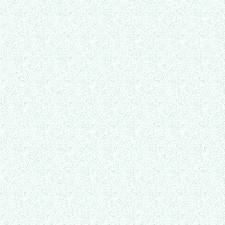 It steps through exam objectives one-by-one, providing concise and accurate review for all topics. Using this book, you will be able to easily and effectively review test objectives without having to wade through numerous books and documents for relevant content for final review. 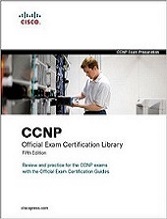 CCNP Certification Library, Fifth Edition, is part of a recommended learning path from Cisco that can include simulation and hands-on training from authorized Cisco Learning Partners and self-study products from Cisco Press. To find out more about instructor-led, e-learning, and hands-on instruction offered by authorized Cisco Learning Partners, please visit http://www.cisco.com/go/authorizedtraining. Coverage of all four CCNP exams enables you to identify and fill your knowledge gap before the exam date.